Ong gave me the recipe for pork noodle soup, which he’d scribbled on scratch paper, a printout of a coupon from a sporting goods store (he and his wife have a couple of kids, both boys). Ong was born in Malaysia, though his dad has Fujianese roots, and this soup is the simplest and homiest of things: pork Ong minced with double cleavers as we talked, stir-fried with ginger and garlic, hot bean paste and fermented mustard greens, with stalks of yu choy, the slightly more delicate cousin of Chinese broccoli. Alex Ong’s pork noodle soup reminded me that cooking is a skill of diligence, of the unglamorous work of getting things ready, of honing. My soup was fine, not as good as Ong’s, not even close. My single, sort-of sharp cleaver made the mince tough and a little dry—I was battering the pork fibers, bruising as I chopped. My soup was a failure, not of cooking, but of patience. Add the chicken stock and ginger to a medium saucepan and bring to the boil over medium heat. Adjust the heat to achieve a gentle simmer and let the ginger infuse, about 10 minutes. Remove from the heat, stir in the sesame oil and add salt to taste. Set aside. Boil the noodles in plenty of water until cooked but still firm, about 3 minutes. Drain, cool under running water, and set aside. Chop the pork using a pair of Chinese cleavers or chef’s knives of equal weight, one in each hand. Try to chop rhythmically, reducing the pork to a medium-fine mince (don’t worry if it looks a little irregular—this is part of its charm). Transfer the pork to a medium bowl, add the five-spice powder and stir with chopsticks to combine. Set aside. Set a wok over high heat. When it’s hot, add the oil and swirl. Add the ginger, garlic, and scallions and cook, stirring constantly, until they’re fragrant, about 1 minute. Add the minced pork and break it up, stir-frying until it turns pale and starts to brown, about 3 minutes. Add the cha choy and hot bean paste and stir-fry until combined with the pork, about 2 minutes. Add the yu choy sum and toss until it’s slightly wilted, about 2 minutes. Add the seasoned stock and bring to the boil. Let it simmer for 1 to 2 minutes, then season with the soy sauce, rice wine, and a pinch of sugar. Taste and add salt as necessary. Add the noodles, stir to combine, and cook to combine the flavors, about 2 minutes. Ladle into warmed serving bowls and garnish with the scallions, chili oil, and sliced cucumber. Serve immediately. 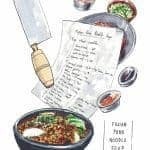 Read John Birdsall’s Crawling Back With Cleaver: Alex Ong’s pork noodle soup reminded me that cooking is a skill of diligence, of the unglamorous work of getting things ready, of honing. My soup was fine, not as good as Ong’s, not even close. My single, sort-of sharp cleaver made the mince tough and a little dry—I was battering the pork fibers, bruising as I chopped. My soup was a failure, not of cooking, but of patience. 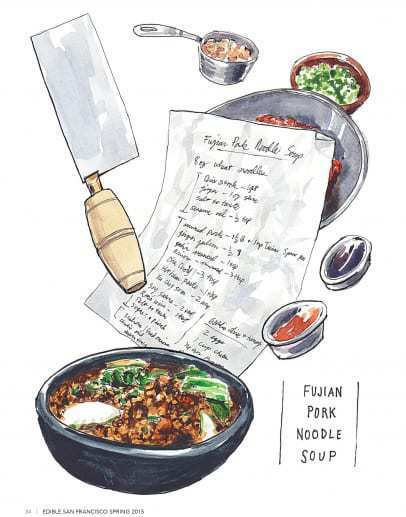 Fujian Pork Noodle Soup, was published in the Spring 2015 issue of Edible San Francisco Magazine. © 2015 Edible San Francisco. Illustration © 2015 Dan Bransfield. John Birdsall is a writer and ex–restaurant cook who lives in Oakland. He has received two James Beard Awards for food and culture writing. John is the coauthor of Hawker Fare: Stories & Recipes from a Refugee Chef ’s Isan Thai & Lao Roots by James Syhabout (Harper Collins 2018), is currently working on a new biography of James Beard. Previous Post: « What Does San Francisco Taste Like?